Yo-ho-ho and a Bottle of Wine! A treasure lies in Portland’s West Hills. The riches discovered are thrilling, indeed, but so are the buccaneers who now claim it as their own. Seven Sails Vineyard is the prize and the proprietors are, you guessed it, pirates. Kate Larsen, one of the principal swashbucklers, traveled the world as a singer on cruise ships — she is also a first-rate gourmand. Her partner in this venture, Shuhe Hawkins, is an actor, arts educator, puppeteer and, now, vineyard manager. They met during a Portland theater gig in which both performed. 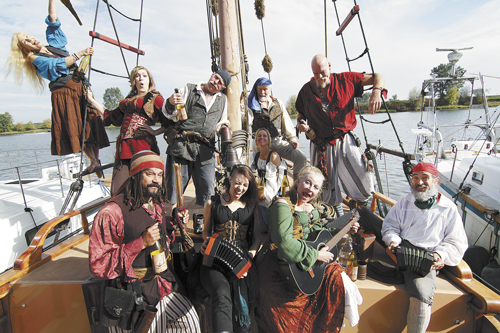 Together they founded the Portland Pirate Festival in 2006, attracting an average of 15,000 patrons annually — due to venue matters beyond their control, the event has taken a hiatus; they hope to resume the event in 2017. Larsen and Hawkins also perform in the BilgeRats & Pyrettes, a multi-genre band with, you guessed it, a pirate theme. The wine business adds a new component to their personae. After all, privateers liberated gallons of spirits and wine at the time they cruised the world’s commercial routes. To a certain degree, Larsen and Hawkins are accidental vintners. As growers on the estate, they dealt with gophers and burrowing bureaucrats — both are pests surmounted. Nature provides the sneaky mammals; Portland dictates the compliance codes. This vineyard — planted all to Pinot Gris — once stood as an amenity of comfortable wealth. It seemed to Larsen and Hawkins the landscape ought to pay its way or, at least, make an attempt. This determination is more than a matter of will. Pinot Gris has an identifiable pedigree dating to the late 14th century, having emigrated from Burgundy, where its sibling, Pinot Noir, became the varietal of choice. It wasn’t until 2005 — when two U.C. Davis researchers mapped the DNA — that Pinot Gris was revealed to be a mutation of Pinot Noir to which its molecular profile is nearly a match. Moving toward Switzerland and into Germany‘s Palatine, it also became in time a go-to grape in Alsace. Here the varietal’s hang time is lengthy, and the ripening clusters develop body and a mouth-filling sweetness distinct but not cloying. It soon migrated to northeastern Italy, as in Friuli, acquiring a wonderful character of acidity married to the pleasing color of light straw. The New World, from Australia to Mendoza, is filled with Pinot Gris vines, as it is a wine that can enter the market early, with far less time after fermentation compared to oaked, buttery Chardonnay. The grape’s European travels moved into the Balkans as well, ending in the Ukraine on the shores of the Black Sea. In addition, the 12th century roads to old Cathay eventually led to modern China where, it seems, everything but oxygen goes to be re-engineered more cheaply. Here in Oregon, we owe David Lett the honor of planting cuttings of Pinot Gris in 1965. Many years later, in 1991, King Estate championed the varietal, capitalizing on the wine’s rapid track to market. The wine has enjoyed great success as the second-most planted variety in Oregon — behind only its close cousin, Pinot Noir. Commercial wineries are flypaper to compliance engineers, the horde who conjure and enforce all manner of codes. To this, one must account for smaller yields and limited case production, and manage the path from bottling to marketplace. You cannot hide three hillside acres of what are now 18- and 12-year-old vines planted by the former owners of the house, who made wine with more of a sense of amusement than ambition. When Larsen and Hawkins decided to make an official effort, they started with all the appropriate agencies. Good thing they did, as the prior owners ran rogue — bottling harvests primarily for friends and not for commercial sale. “It was good to put the formalities behind us,” Larsen said, “because these hills are filled with people who like being left alone. Had we ignored protocol, who knows whether we could have launched this enterprise meaningfully” — one imagines federal tax agents in Sikorsky helicopters droning over the staid West Hills enclave. 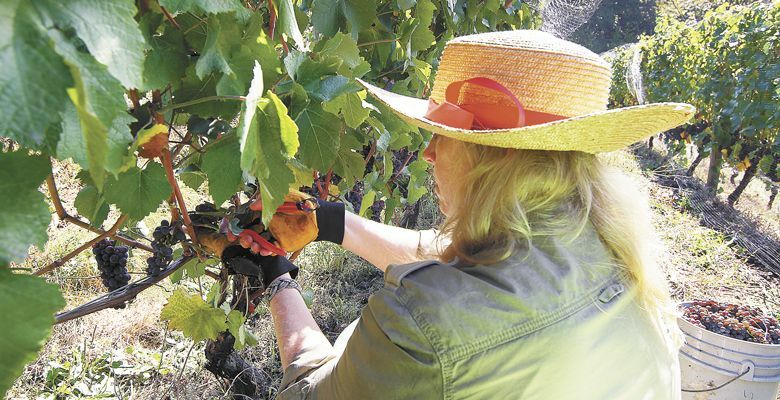 Whether it’s growing Pinot Gris or performing as pirates, Larsen and Hawkins waste no time. “We jump into everything we do with two feet and expect to figure things out as we go,” she explained. Their undeniable zeal explains their possession of Royaliste, an interpretation of a ketch-rigged privateer typical of those in service between 1755 and 1812. Built in Nova Scotia in 1971, the ship was originally a floating historical attraction for the Canadian War Museum. Royaliste emigrated to work the Eastern Seaboard, the Western Seaboard and the Great Lakes. Kate and Shuhe discovered her marooned in Kentucky following the Mississippi Flood of 2011. In the end, she was brought west to Oregon via a flatbed truck. Larsen and Hawkins intended to use it for sail training and as a show and tourist venue in the Northwest. Four years ago, they participated in one of those ersatz Columbia River marine festivals arranged by promoters to sell memorabilia and who knows what else. All was shipshape until the local paddle wheeler — you can see it on the river downtown in Portland — backed into the commerce raider, pushing it into the concrete bulkhead along the riverfront, unsealing its sturdy wooden hull in many places. Suddenly, Treasure Island turned into the Titanic, and Hawkins found himself knee deep in bilge water, bailing it out with a bucket. Though some repairs were made from damages, the Royaliste mishap amounted to six figures, the ship still needs a comparable sum to fulfill its intended purpose, which returns the story to wine, a less-leaky venture to date. Seven Sails’ limited output precludes commercial distribution at this time. Vintage 2013 sold out of its tiny 46-case output; 2014 still has about half its 215-case yield, and 2015, newly released, will push past 300. The economics do not favor marketing blitzkriegs, thus Larsen and Hawkins, vineyard owners and pirates, find themselves calling on local markets and restaurants to sell their wares. So how is the wine? 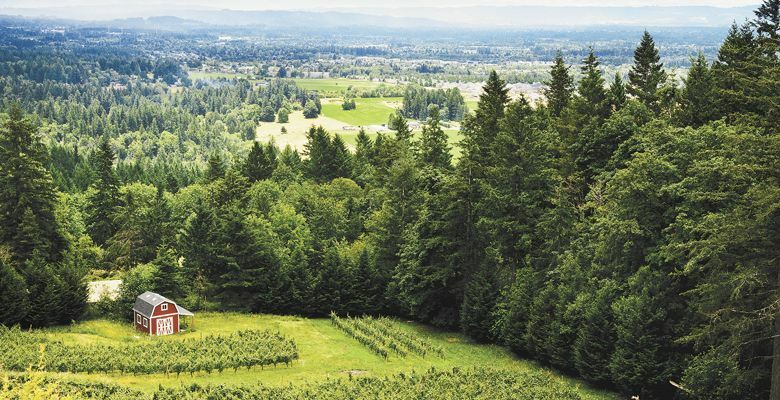 Most urban wineries source grapes from beyond city limits; Seven Sails reverses course, sending Portland grapes into the countryside to produce its wine. Larsen and Hawkins engaged the winemaker, John Derthick, who had also worked with the former property owner. They walked the vineyard with him, asking the wine be made according to their input. Respect is due. We tasted the 2013 — in 2015 — and liked its acidity and finish. At the same time, we were underwhelmed by the 2014. But now, with another year in the bottle, this second pirate vintage is drinks beautifully — Brie or Irish Cheddar do it even more justice. The newly released 2015 possesses a long crisp finish. After a surprising flash of green midway on the palate, the second pass a week later rounded the impression fully. You taste this hillside, nearly 1,000 feet up, in the Portland postal code. Who would have thought pirates drank anything but rum? Wager that the sailing will grow smoother in time as well. 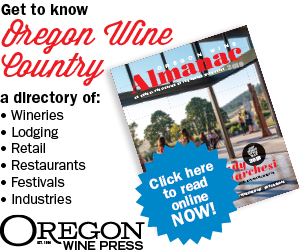 Ken Friedenreich is writing a book on Oregon wine called “Decoding the Grape.” He contributes to various publications as a wine editor and columnist.